The Haryana Congress is likely to get its new president “soon”, this was claimed by a senior party leader here today. How soon? While the leader, who did not want to be identified, said “soon” should be read as “within next week”. The Haryana Government has earmarked Rs 380 crore to provide better healthcare facilities to the people in the state during the current financial year and special attention would be given to the improvement of women and child health. The Chief Minister of Haryana, Mr Bhupinder Singh Hooda, lays the foundation stone of a Rs 30-crore hospital and nursing college in Bhiwani on Sunday. Families of farmers killed during the Kadma and Mandiali agitations against power bills in 1995 and 1998 today honoured Chief Minister Bhupinder Singh Hooda for the waiver of power bills at a marathon Dhanyavad Rally held here today. The irregular power supply and long and unscheduled power cuts imposed daily have put the normal life out of gear in this town and other parts of the district. Though the power cuts were being imposed in the past too, for the past two months the frequency and duration have increased. The Haryana Government is considering a proposal to construct a storage dam of 37,000 acre-foot-capacity over the Ghaggar near Pinjore, to supply drinking water to Panchkula. With just two weeks left for the new academic session to start, Chaudhary Devi Lal University has yet to appoint teachers and provide the basic infrastructure, including furniture to accommodate the new classes. Mr Karamvir Singh, president of the Confederation of SC/ST and BC Employees Organisations, yesterday said the condition of Dalits had somewhat improved in Haryana and elsewhere after the Congress came to power at the Centre. Mob attacked and pelted a team of officials with stones when they went to Ram Colony to stop a child marriage on Friday. The team was headed by the SDM, Jind, Mr Dinesh Yadav, and it comprised Mr Virender Kumar Vij, DSP, Jind, and other police officials. As many as 63 young couples tied the nuptial knot at a national-level mass wedding ceremony held under the auspices of the Rewari Thathera Samaj here yesterday. The marriages were solemnised according to the Hindu religious rituals. Capt Ajay Singh Yadav, Revenue and Irrigation Minister has asked officials to take adequate and effective steps for checking the flood situation in the district. The Haryana Congress is likely to get its new president “soon”, this was claimed by a senior party leader here today. How soon? While the leader, who did not want to be identified, said “soon” should be read as “within next week”. However, he did not rule out the possibility of the week extending to a fortnight or even a month in view of the intense lobbying by various factions of the party. Technically, the general house of the Pradesh Congress Committee (PCC) is yet to be constituted because various leaders could not agree to the names of the PCC delegates. Interestingly, without the general house being in order, a meeting of the PCC was convened here on June 29 at which it was unanimously resolved to authorise the AICC President, Mrs Sonia Gandhi, to nominate the new president of the Haryana Congress. Since then various factions of the party are lobbying in Delhi to have their man in the saddle. Since the Chief Minister, Mr Bhupinder Singh Hooda, belongs to the Jat community, the party chief would be a non-Jat as per an unwritten rule of the Congress. Mr Hooda, according to informed sources, is in favour of Mr Harpal Singh, a senior party leader and former party president, to placate the Punjabi community. He is also not averse to the names of Mr Avtar Singh Bhadana, MP from Faridabad, and Dr Ram Prakash, a former minister, for the post. The Haryana Congress president, Mr Bhajan Lal, the sources say, wants to continue for one more term. The sources say the veteran leader will not mind stepping down in favour of his younger son, Mr Kuleep Bishnoi, MP from Bhiwani, whom he is believed to be now promoting as his political inheritor. The working president of the Haryana Congress, Mr Randeep Singh Surjewala, and his father, Mr Shamsher Singh, a former party chief, would like Dr Ram Prakash to be the next party president so that due representation is given to the Backward Classes, the sources say. If the post is to go to the Punjabi community, the Surjewalas are believed to be in favour of Mr Balbir Pal Shah, MLA from Panipat and former party president. A former minister, Mr Ramesh Kaushik, who is close to the AICC General Secretary in charge of Haryana, Mr Janardan Dwivedy, has also staked his claim to the post. A veteran leader, Mr Birender Singh, is believed to have extended his support to Mr Kaushik. There is another school of thought within the party which argues that the post should go to Ahirwal, which has been traditionally supporting the Congress. Rao Inderjit Singh, Union Minister of State for External Affairs; Capt Ajay Singh Yadav, the Haryana Irrigation Minister; and Mr Dan Singh, MLA, qualify for the slot. Since Rao Inderjit Singh and Capt Yadav are unlikely to quit their ministerial assignments for the organisational job, Mr Dan Singh is the only Ahir leader of substance, who fits the bill. This was stated by the Chief Minister, Mr Bhupinder Singh Hooda, while addressing a public meeting before laying the foundation stone of a 175-bed hospital and nursing college to be set up by the Sri Hari Health and Education Foundation at a cost of Rs 30 crore here today. Mr Hooda maintained that the foundation was playing a pivotal role in the service of humanity. While paying tributes to former Chief Commissioner of Customs late Mahesh Kumar, he said that Kumar was an embodiment of sacrifice and dedicated to the social service. While lauding the role of the voluntary organisations in spreading education and health services, Mr Hooda said the government could not meet the requirement of education and health of the increasing population without the help of voluntary organisations. He declared that the government would recruit 400 staff nurses. Besides, efforts would be made to provide par-medical staff in all the health institutions. The Chief Minister said that with a view to providing 24-hours delivery and emergency services, the government had started child health services in the state from April last. While expressing his concern over girl foeticide in the state, he said that it was a blot on society and it could be curbed only by social awareness. Mr Hooda also laid the foundation stone of a veterinary polyclinic to be built at a cost of Rs 1.45 crore having all basic facilities. He went round an exhibition organised by the Animal Husbandry Department. Referring to the demand by former Chief Minister Bansi Lal, who was also present among other leaders, he said that all the main roads in the town would be repaired on priority basis after monsoon. He directed the Superintendent of Police to nab the culprits who were involved in looting a shop five days ago in the city. The next of kin of the deceased farmers presented Hooda with a 10 kg silver replica of a power sub-station as a symbol of their gratitude. This village falls in the Bhadra Assembly segment whose farmers owed Rs 223 crore in arrears of power bills to the state power utilities. This amount is the highest for any Assembly segment in the state. The rally was organised by the Congress MLA Dharamveer since the waiver had brought the maximum relief to farmers of his Assembly segment. The area had seen bloody confrontations between agitating farmers and the then governments on the issue of arrears of power bills. Several farmers were killed during the stir which was spearheaded by farmers of Kadma and Mandiali villages. The rally set a new record for its duration. It commenced at 10 am and concluded at 5.45 pm. Addressing the farmers, Mr Hooda said the waiver decision was the most difficult decision of his career as a politician. Despite advice to the contrary he decided to approve the waiver because he did not want the sacrifices made by the farmers on this issue to be wasted. At the same time he appealed to them not to let arrears build up in the future as no other government would henceforth be able to waive arrears if any. He said his government had set a new record since no state government in the history of the country had provided so much relief to the farming community in one go. He directed officials of power utilities to implement the decision in letter and spirit. He said the domestic, horticultural and panchayat tubewell connections would also be covered by the waiver. So far officials had not included these categories in the waiver. The Chief Minister announced that the rates for erection of poles for tubewell connections had been cut by half. Instead of Rs 7,000 per pole, farmers would now pay Rs 3,500. Likewise, disconnected connections could be reconnected by paying Rs 1,000 for disconnections less than six months old and Rs 2,000 for older disconnections. He announced that the government would spend Rs 637 crore on new power sub-stations in the state to augment the transmission system. Separate transmission systems would be set up for rural and urban areas of the state, he added. Mr Hooda said he had prepared a revolutionary blueprint for Haryana’s overall development. When implemented it would change the face of Haryana. He said he expected investors to pump in Rs 2 lakh crore in Haryana over the next decade which would help generate large scale employment. After seven years, he said, there would at least be one or two members of each family with a regular job. 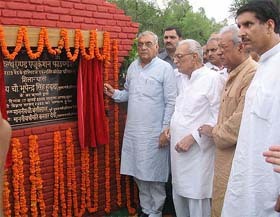 Mr Hooda inaugurated a girls’ college in the village established by the village panchayat. He also announced grant of affiliation to the college. The rally’s organiser and the Congress legislator from Badhra, Mr Dharamveer, said the peasantry had found a mentor in Hooda and hoped that farmers would never have any problems in the future. Education Minister Phul Chand Mullana, Congress MP Jai Parkash and a number of party legislators were also present at the rally. As a result of the erratic power supply, domestic, industrial, agricultural and other non-domestic consumers, including those running workshops and carrying on other business activity, continue to suffer as they have been adversely affected by the shortage of power. Most of them have to depend on generators which are costly and inconvenient. Consumers of different categories claim that no day passes when the power is not switched off for 10 to 12 times daily for durations ranging from 10 minutes to two hours and sometimes even more. The consumers say it is better if the power cuts are imposed for a few hours continuously every day rather than impose them a number of times. The short supply of electric transformers has further aggravated the power supply situation in the rural sector as there is a long waiting list. Farmers meet local officers for the replacement of their damaged transformers, but have to go back disappointed. The power board officials maintain that the demand for transformers was manifold as compared to the supply received by them. The matter of the shortage of power and transformers was recently raised by Mr Shamsher Singh Surjewala, Mr Tejinder Mann, Mr Dinesh Kaushik and Mr Dillu Ram, all MLAs, during a meeting of the District Grievances held here on July 11 which was presided over by the Transport and Public Health Minister, Mr Randeep Surjewala. He assured them that the government was trying its best to increase the availability of power and procure transformers at the earliest. 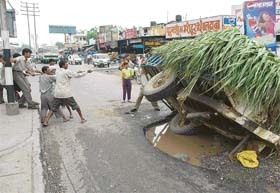 But the MLAs pointed out that the standing paddy crop would suffer huge losses if the situation did not improve. Power consumers have urged the government to take immediate steps to improve the supply of transformers and make. more power available to them. This was disclosed at a meeting presided over by the Chief Minister, Mr Bhupinder Singh Hooda, to review the flood-control measures held here last evening. Mr Hooda directed all departments, especially the Irrigation and the Public Health, to take all necessary measures so as to save the state from floods. The meeting was informed that Rs 3.72 crore had already been provided to the district administration and the Health as well as the Public Health Departments to take measures to check floods and provide relief to the affected people. This amount included an allocation of over Rs 2.22 crore to all Deputy Commissioners for dewatering and other relief measures, Rs 1 crore for the Health Department and Rs 50 lakh for the Public Health Department for dewatering operations in urban areas. The Chief Minister also ordered that an additional amount of Rs 20 crore should be released to the Irrigation Department for the speedy completion of drainage works in the state. It was stated at the meeting that in all, 88 villages in the state were affected by the floods. Eight deaths had been reported so far due to heavy rains. As many as 39 cattle had died and 12,984 acres of cropped area was affected. Apart from this, 220 houses were damaged and damage to public property amounted to Rs 90.25 lakh. It was observed that the pattern of rainfall so far had been satisfactory. It was informed that so far Jind district had received a maximum rainfall of 1339 mm followed by 838 mm in Faridabad, 752 mm in Jhajjar, 611 mm in Gurgaon, 561 mm in Kaithal and 550 mm in Rewari. Inquiries revealed that the university was bound to face extreme difficulty in accommodating the new classes from August 1, when the new session starts. Despite completion of three years since its inception, the university has failed to raise the infrastructure. The university is running from a single building that houses the classrooms and the administrative wing. According to the university officials, the institution is ill-equipped for the new academic session At present the university is running 20 departments, including languages, science, commuter science, management, physical education, but failed to provide the basic necessities like classrooms. Real problem, said the sources, would start from the coming session with an increase in classes. Though the university had decided not to start any new course but there would be no space to accommodate the second year students. The other probable place where classes could be taken is the University College (UC) but the teachers dismiss the same due to the distance, as it is located 2 km from the varsity. Moreover, sources say the UC is already facing shortage of accommodation to adjust nearly 6,000 students. Last year the university started nine new courses but now there would be no space to accommodate the classes. Lamenting the situation a number of students on the campus said that their future was hanging in the balance as the lack of space would hamper the academic environment. Similarly, the university had also failed to initiate the process of recruiting teachers in different departments. So far, the university has a meagre strength of 39 regular teachers, including one Professor, seven Readers and 31 Lecturers. “We were in bad shape when the BJP-led NDA was in power at the Centre. It is different now and we are feeling more secure ever since the UPA formed the government in Delhi,” he said while addressing a press conference here. The Dalit activist had shot to fame by organising a function to convert Dalits to Buddhism in the aftermath of the brutal killing of five Dalit men in Jhajjar district. He said the drive to convert people to Buddhism was continuing at a low key now because the resentment of Dalits was less now than what it was during the NDA regime. “However, conversion is still very much on our agenda,” he said. The Dalit activist was earlier a part of the Udit Raj-led All-India Confederation of SC/ST and BC Employees Organisations. He said he and his supporters broke away from that organisation because Mr Raj had also floated a political party with himself as its president. “We did not want to become part of a political party. Our repeated requests to Mr Raj to relinquish the post of president of the confederation to an apolitical person did not yield any result,” Mr Karamvir Singh said. On the issue of Dalit employees, he said the Haryana Government must implement the 85th Amendment to the Constitution and pave the way for the accelerated promotion of Dalit employees. He said 18 states, including Andhra Pradesh, Assam, West Bengal, Orissa and Rajasthan, had already implemented the guidelines in the amendment. He added that the state government must quickly clear the huge backlog in recruitment to posts for SCs in the government as well as boards and corporations. Mob attacked and pelted a team of officials with stones when they went to Ram Colony to stop a child marriage on Friday. The team was headed by the SDM, Jind, Mr Dinesh Yadav, and it comprised Mr Virender Kumar Vij, DSP, Jind, and other police officials. Five persons, including three police officials, received minor injuries in the attack. The mob also damaged the official car of the SDM. The district authorities had reportedly received information that a marriage party from Sikar district of Rajasthan had arrived in the colony and a child marriage was going to be solemnised. The authorities sent a team of revenue officials to verify the age of the bride and the bridegroom. The team told the authorities that the age of the bride, Nita, was around 13 years, while the bridegroom, Thakur, was aged around 16 years. Another team headed by the SDM, Jind, reached there and stopped the marriage. About 300 persons, who had assembled to attend the marriage, threw stones on the team in protest against the prevention of marriage. The police resorted to mild lathi charge to disperse the crowd. A medical examination of bridegroom was conducted to verify his age. According to doctors, his age was around 16 years. The police has registered a case under the Child Marriage Restraint Act against the parents of the bride and the bridegroom. A case has also been registered under Sections 353 and 332 of the IPC against several unidentified persons for attacking the team of officials. As many as 63 young couples tied the nuptial knot at a national-level mass wedding ceremony held under the auspices of the Rewari Thathera Samaj here yesterday. The marriages were solemnised according to the Hindu religious rituals. The couples, their parents/ guardians and other relatives had come from various parts of Haryana, Rajasthan, Uttar Pradesh and Madhya Pradesh. Mr Jai Gopal Bhalia, president, and Mr Ved Prakash Anant, secretary of the mass wedding sammelan, said a wedding gift package comprising a Texla CTV set, a Toshiba sewing machine, a wrist watch (each for the bride as well as the bridegroom), a dinner set, a ceiling fan, a suit case, a safari suit (for the bridegroom), two sarees, a jewellery set and a pair of ankelets (for the bride) was presented to each couple on behalf of the samaj. In two separate sessions, the Union Minister of State for External Affairs, Rao Inderjit Singh, as well as the Haryana Irrigation and Revenue Minister, Capt Ajay Singh Yadav, gave their blessings to the couples. Addressing a meeting of the district officials in the Panchayat Bhavan here today, he also asked them to ensure the supply of potable drinking water and power in all areas. He warned that the state government would take stern action against the officials found guilty of non-compliance of the state Government’s instructions in this regard.